The Aristarchus plateau is one of the most geologically diverse places on the Moon: a mysterious raised flat plateau, a giant rille carved by enormous outpourings of lava, fields of explosive volcanic ash, and all surrounded by massive flood basalts. A relatively recent asteroid (or comet) slammed into this geologic wonderland, blowing a giant hole in the ground revealing a cross section of over 3000 meters (9800 ft) of geology. No wonder planners for the Apollo missions put this plateau high on its list of targets for human exploration. This amazing image was acquired on 10 November 2011 as LRO passed north-to-south about 70 km east of the crater's center while it was slewed 70* to the west. The spacecraft was only 26 km (16.2 miles) above the surface; about two times lower than normal. For a sense of scale, that altitude is only a little over twice as high as commercial jets fly above the Earth! Aristarchus crater is located on the southeast edge of the Aristarchus Plateau. 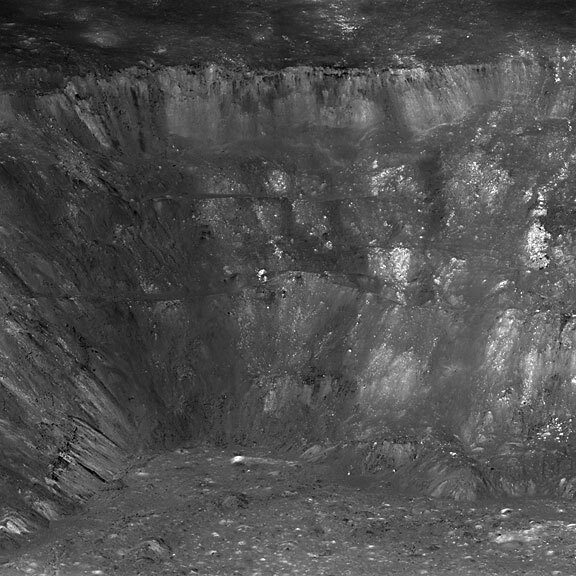 This gaping crater is 40 km wide and 3.5 km deep. The ledges forming the wall of the crater, which look a lot like those of a strip mine, are actually blocks of pre-impact crustal and surficial rocks that slumped into the crater during the late stages of its formation. The impact that formed this crater occurred on a mare-highland boundary and thus excavates a variety of rock types. \r\n\r\nThe Aristarchus plateau is one of the most geologically diverse places on the Moon: a mysterious raised flat plateau, a giant rille carved by enormous outpourings of lava, fields of explosive volcanic ash, and all surrounded by massive flood basalts. A relatively recent asteroid (or comet) slammed into this geologic wonderland, blowing a giant hole in the ground revealing a cross section of over 3000 meters (9800 ft) of geology.